A formerly homeless Marine aims to help fellow veterans get on the road to recovery in a souped-up RV. A self-proclaimed “street kid” from Spanish Harlem, Lamonte Hampton was selling drugs on Wall Street by the age of 12. He was darn good at it, too. So good that it started to scare him–and he asked his mom to sign him up for the Marine Corps after his 17th birthday. For the next four years, Hampton served in the Philippines, Guam and Japan. Then, one morning in 1987, he was honorably discharged–with zero warning. Hampton spent the next few years “overstaying [his] welcome” on friends’ couches, sleeping in his car and occasionally working as an armed guard. He sold plasma for cash and scored food by reading obituaries in the newspaper. I’d go to funerals and pretend to be part of the family so I could eat. 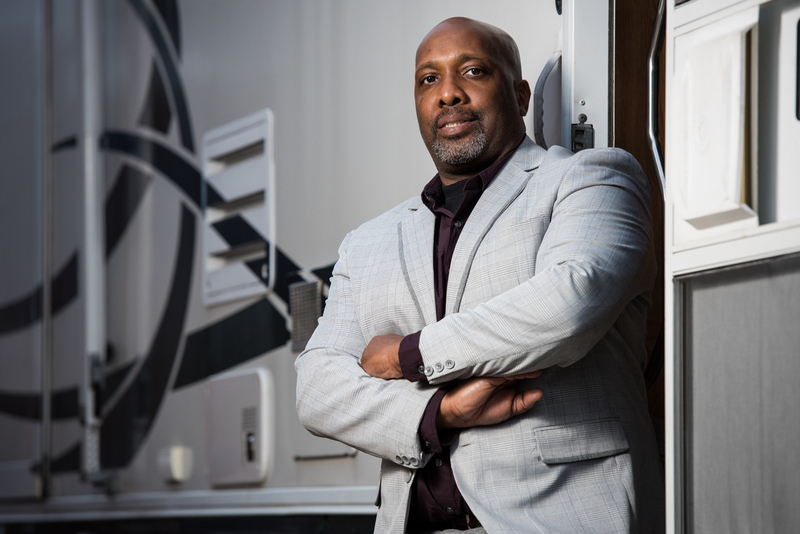 Today he’s using that skill as the founder of Soldiers at Ease, which will deliver life-changing services to homeless veterans in an RV decked out with wifi, docking stations, a fully stocked kitchen and bathroom, and a lounge where families can come visit their loved ones in a safe, comfortable setting instead of meeting on the street. “My first priority is getting vets their VA cards. After that, if you need a haircut or want to check your email or freshen up for an interview, go for it,” says the certified pastoral counselor, who also plans to offer one-on-one therapy in addition HIV testing, blood pressure check-ups and other health screenings. “We’ll be a one-stop-shop that connects veterans to the resources they’ve earned and jump-starts the healing process for mind, body and spirit,” he says.